A business website will help you stay competitive in a fast-growing corporate world. The website creates an online presence for your business and increases its reach to a large number of customers. It will help you build a better relationship with your customers, increase sales, and promote your company in a less expensive way. But, I bet you already know that. Maybe what’s stopping you from creating a business website is the cost, time, and extra human resource. Well, if that’s the case, I have a solution for you. 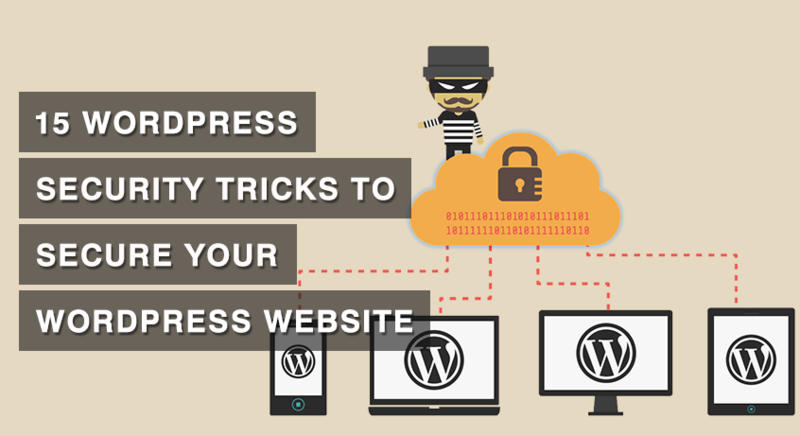 Create your business website with WordPress! It’s easy, inexpensive, fun, and you can do it yourself. WordPress is a great platform for creating any sort of business websites. Here are some business website’s created using WordPress. WordPress provides sheer amount of themes and plugins that can be easily used to change, customize, and enhance the functionality of your business website until it reflects your brand to sell your products and services more effectively, and create an engaging space for your customers to visit. In addition to being super customizable and flexible, WordPress is easy to learn and use. As for the cost, well, you can create a fully functional and professional business website under $110. 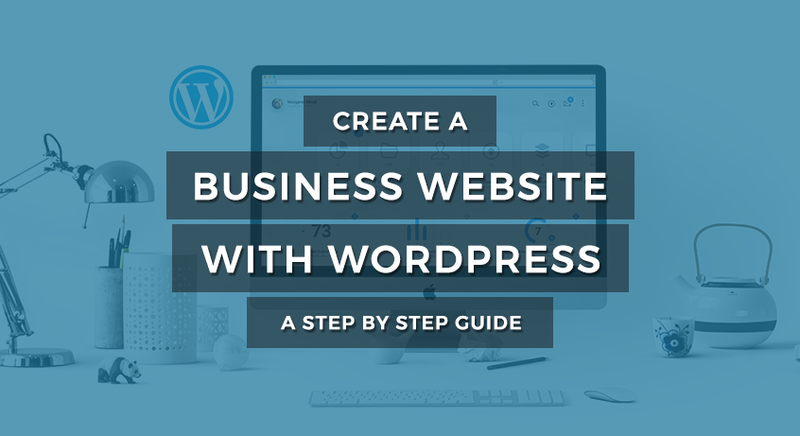 Spare an hour of your time and stay with me till the end of this step by step guide on how to create a business website with WordPress to be surprised! When you reach the end of this article, you will feel like a web designer (because you created a website on your own). This guide will walk you through all the main steps you need to consider when building your first business website. So, grab a drink if you want, and let’s start! Why use SiteGround for hosting Business Websites? 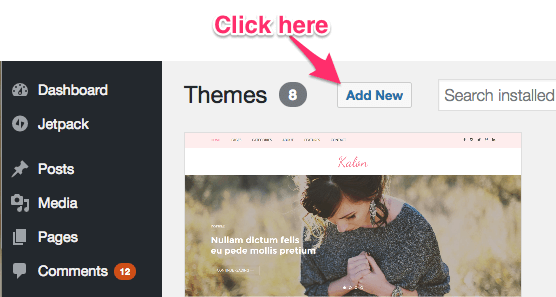 How to install a WordPress theme on your WordPress website? E-Commerce Website – The purpose of the e-commerce website is to sell products or services online. Branding Website – The branding website contains information about the company, the product, and the service. The aim is to make a user familiar with your brand and to promote businesses. Lead Generation Website – The lead generation website is designed to generate leads for a business through a combination of web forms, tracked phone lines, and offers. Support Website – The support website is often used by larger tech companies to support hardware, software, or services that they provide. So, what type of Business website do you want to create? Or, do you want to create a multipurpose Business website? Now, let’s go through these steps in detail. The first step is to choose a domain name for your business website. The domain name represents the identity of your brand and your business. So, the name should be short, easy, memorable, and relevant. Pick your business name as your domain name. Avoid domain names similar to your competitors. You don’t want people to go to their websites instead of yours. Google the term or phrase you chose before you get the domain. There could already be some high ranking websites or products for that term. This will make your domain difficult to rank on search engines. So, better avoid those terms or phrases. Once you are ready with your prospective domain names, go to Namesilo and check for their availability. Enter the possible names in the search box. Since the ‘.com’ domain is common among people and is trustworthy, try to enter the name with ‘.com’ suffix. In case you don’t get a ‘.com’ domain, ‘.net’, ‘.co’, and ‘.biz’ could be some good alternatives for your business website. Try until you find the right domain name for your website. Once you find a domain name at Namesilo, don’t register it there. We are using Namesilo just to check the availability of the domain name. I will guide you to get a domain name for free in the next step. A web host is a place where all the contents of your website reside. You need to buy hosting from the web hosting companies. Web hosting service allows your website to be displayed on the Internet. Thus, it is important to use a reliable web hosting service. There are many types of hosting. Let’s not get into it for now. You can read about them later in our detail hosting comparison and review article. For those who are just starting out, a shared hosting plan is the best because it is cheap and easy to use. We use SiteGround for Rara Theme web hosting and would recommend everyone as it is cheap, reliable, and WordPress ready. 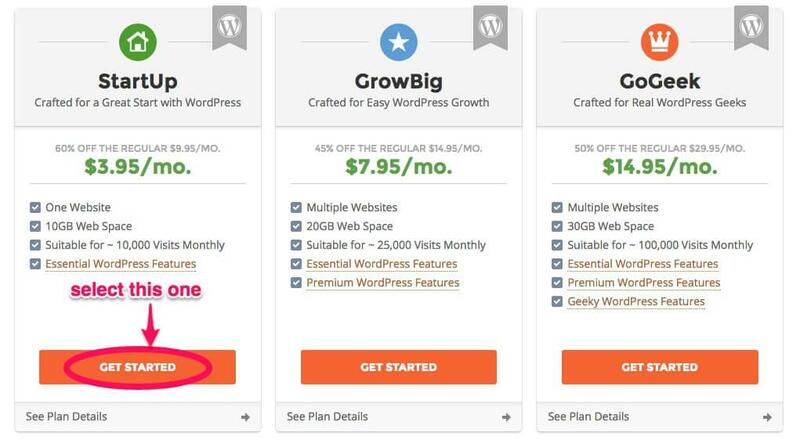 SiteGround gives you a free domain. 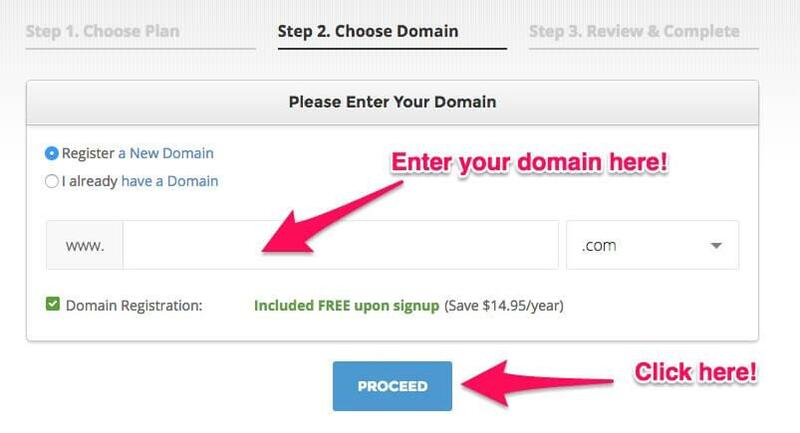 Here, you can host your domain name for free. There are only a few web hosts that offer free domain name. SiteGround is officially recommended by WordPress. SiteGround has uptime of 99.99%. This means your website will always be accessible. SiteGround has an excellent 24/7 customer support service. SiteGround is one of the fastest web hosts. SiteGround uses SSDs on their servers and provides fast speed at a relatively lower price. You get free SSL certificate (HTTPS) on SiteGround. SiteGround offers built in Let’s Encrypt SSL certificate. Having an SSL certificate makes your blog trustworthy. Also, the chance of your website ranking at the top in Google search results is high with SSL. Step 1: Go to SiteGround by clicking here. Step 2: Choose the StartUp plan by clicking GET STARTED. You can choose other plans as well. But, as a beginner, Startup plan will work. Step 3: Select register a new domain. Enter the domain name you searched at namesilo.com here. And then, click PROCEED. Step 4: Lastly, enter your name, physical address, email address, payment information, and period of your subscription. 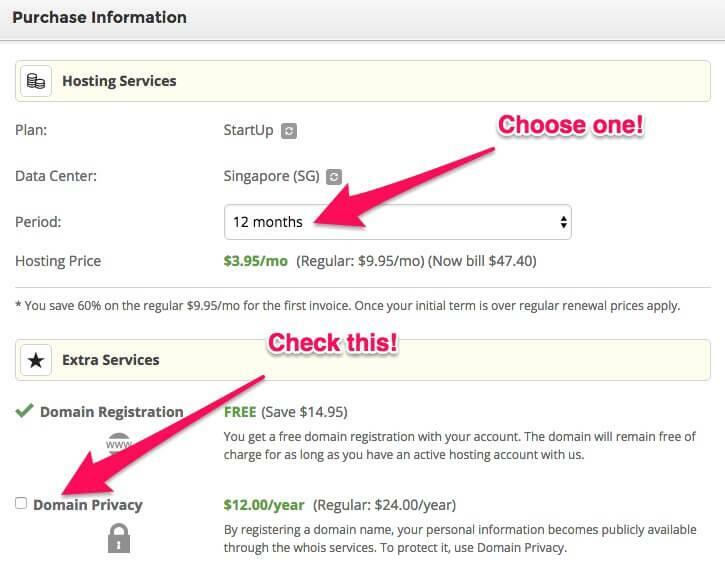 I recommend you to check the Domain Privacy in Extra Services section. Domain Privacy safeguards your information like name, address, and phone number from Domain WHOIS search. This means your personal information will be protected. Once you register with SiteGround, you can install WordPress with a few clicks. First, login to your SiteGround account. Check your email for the login info. You will get an email with login instructions after you successfully register at SiteGround. Then, follow these easy step by step instructions by SiteGround. Your WordPress website will be ready in a few steps…Be sure to enter a valid email and remember your WordPress password. You now have a business website of your own. I told you it was easy. Now, let’s proceed further and give your website a professional look. Before that, let’s do some optimization by accessing your WordPress admin panel and changing some settings. Type http://yourwebsite.com/wp-admin on your web browser and hit enter to access the admin panel of your WordPress. Login with your credentials (username or email and password). After you login, you will be directed to the WordPress Admin Panel. This is where you will personalize your website, add pages and content. 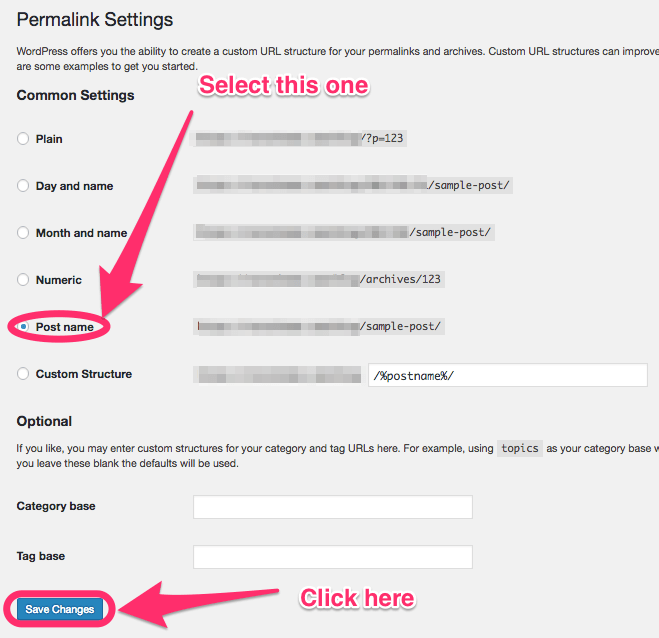 Now, go to Settings and click on Permalinks. 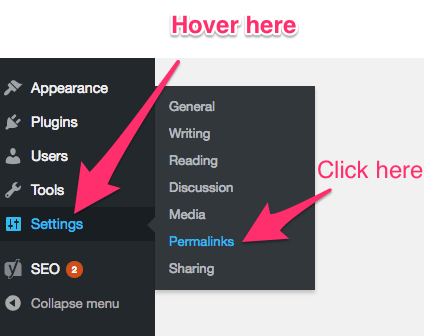 Then, in the Custom Settings select Post Name and click Save Changes. 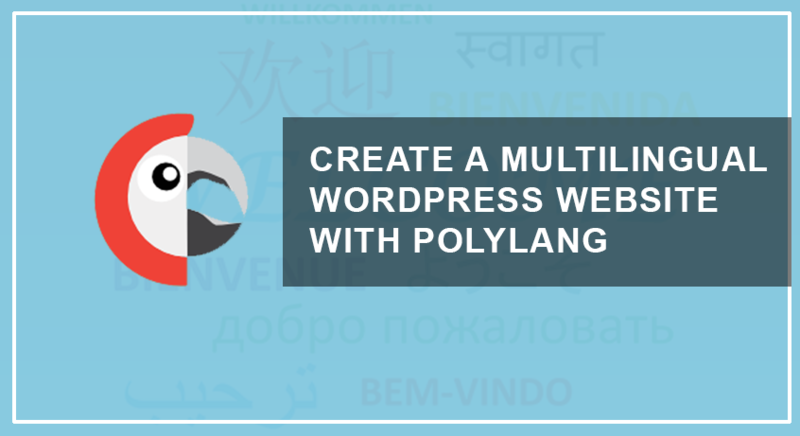 In WordPress, you can easily change the appearance, layout, and design of your website using themes. So, you have to find a good looking WordPress theme that suits your purpose and install it on your business website you just created. And, in no time, your website will look beautiful. Before you choose a theme and install it, here are a few things to look for while choosing a WordPress theme. Design: You should select a theme that looks clean, professional, and suits your business. Designer: You will run into many technical errors if the themes are poorly coded. They lower the performance of your website and limit your website’s ranking on search engines. So, it’s important that you know if the designer of the theme is experienced enough. Responsiveness: You don’t want to miss an audience on any platforms, hence choose a responsive theme that is optimized for every type of electronic devices, be it a computer, or a mobile or a tablet. SEO Ready: If a theme is Search Engine Optimization (SEO) ready, your website will rank higher in Google Search results. Thus, more people will have access to your website, which is good for popularity. To check if a theme is SEO ready, go here and paste the URL of the theme. If a theme has many errors, avoid the theme. A theme with few errors is better for SEO. Support from the developer: This applies mostly to the Premium themes. When you buy a Premium theme, check how responsive the support team is. You can refer to this blog post on how to choose a WordPress theme to select a theme for your website. For this guide, I’m going to pick a business WordPress theme – Business One Page, which has all the important elements necessary for a business website. You can find some elegant business WordPress themes here. 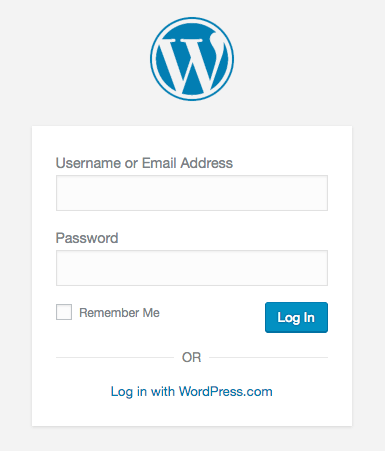 First, log in to the WordPress Dashboard – http://yourwebsite.com/wp-admin. Then, go to Appearance >Themes. Click on the Add New button at the top. 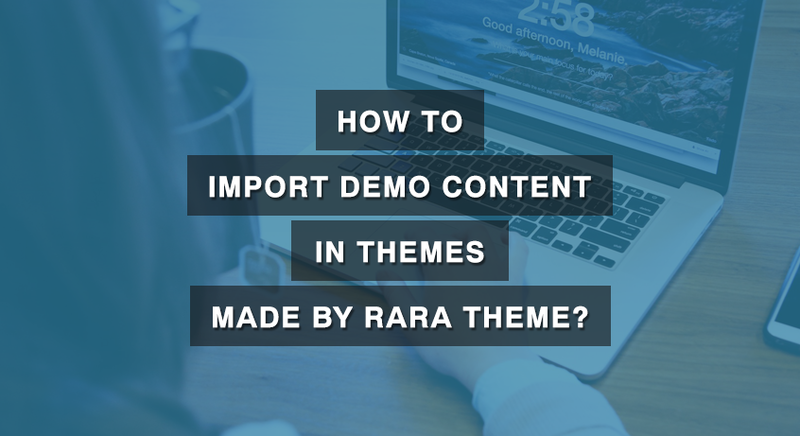 Here we can install and change the theme by two methods – directly from the WordPress Repository (for free themes only) or by Upload Method. After you click on Add New, WordPress Repository shows you the list of featured themes on the dashboard. Search for Business One Page or a theme of your interest in the search bar, and click Install. WordPress will then install the theme on your site. 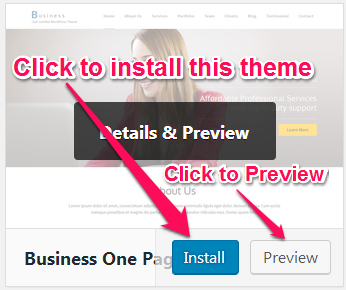 Now, click Activate to make it the default theme of your business website. 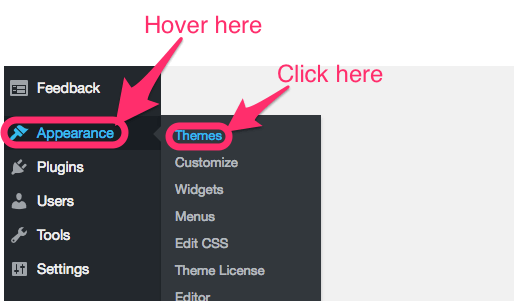 After you click on Add New, click Upload Theme to upload your theme to the site. Then, click Browse and select the theme that you downloaded or purchased from your computer. The theme should be in “.zip” format. After the theme is successfully uploaded, click the Install Now button. Your theme will be ready in a few seconds. 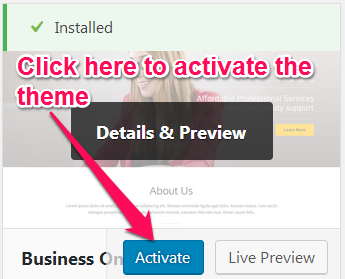 Finally, click on Activate to activate the theme on your business website. 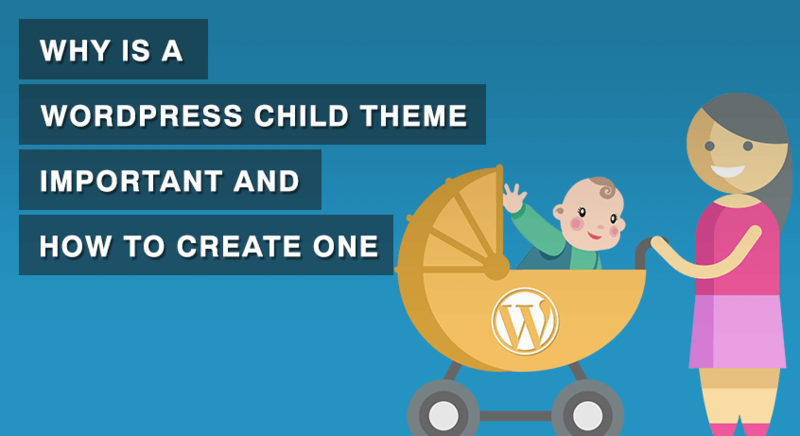 You have successfully installed a business theme on your WordPress website! You can find many WordPress themes on the internet so you should investigate a lot of themes before choosing the correct one. To make things easier for you, I have listed seven best free and paid themes for a business website. All the listed premium themes have free versions too. You can try out the free versions first before you go Premium. If you find the free versions intriguing and want to run your WordPress website for a long time, investing few bucks on a quality Premium theme is truly a good investment. Also, the Premium version has many features. Plus, you get an awesome support from the developers. 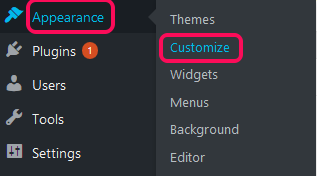 Read here for 7 reasons to choose a Premium theme. Note: All the themes listed here are made by our team. We have lots of beautiful themes for various purposes. However, the list contains only the themes that are appropriate for a business website. All our themes are designed and coded by a team of experienced designers and developers. All the themes are responsive and SEO ready. And, you get a first-rate support from our designers. 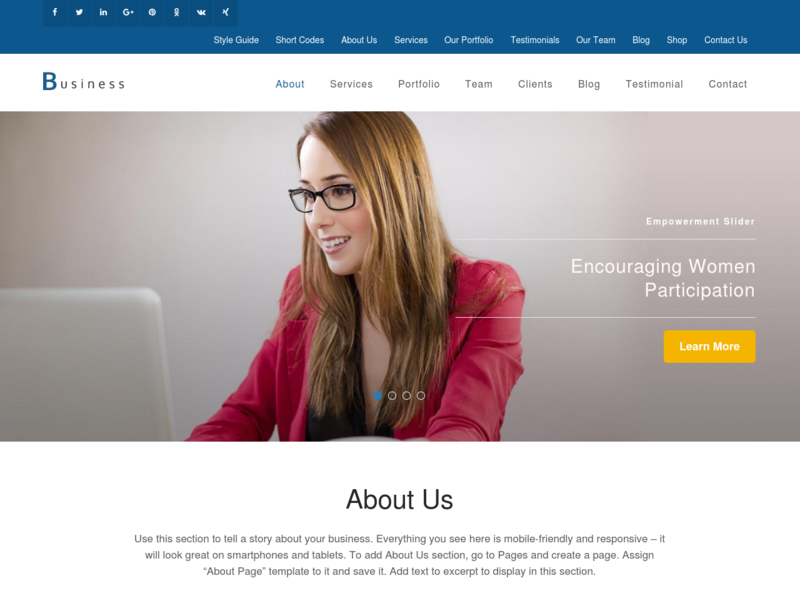 Business One Page Pro is an exquisite one-page theme best suited for businesses, creative agencies, corporations, and freelancers who are looking to grow their online business. The theme allows you to create a beautiful, clean, and professional website that has a responsive design, loads faster and is optimized for SEO. The design allows you to include various sections like testimonials, portfolio, services, team, etc. to creatively showcase your business through your website. 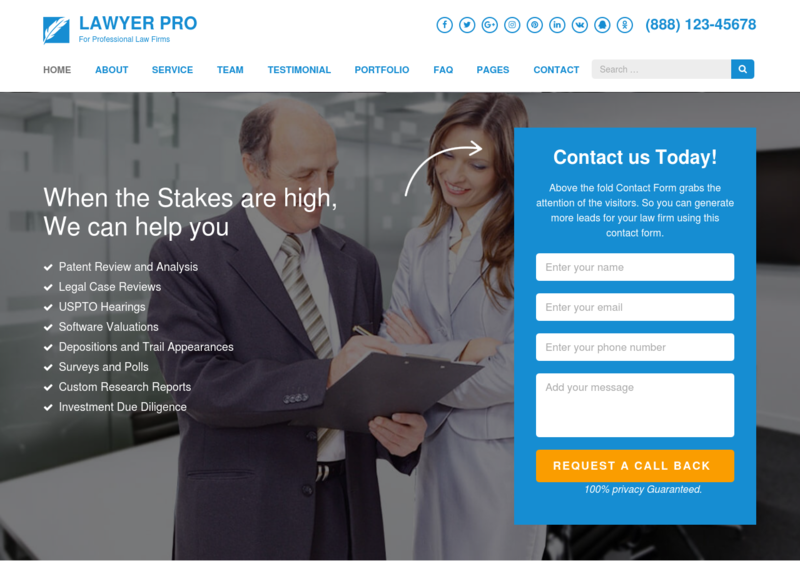 Lawyer Landing Page is a professional WordPress theme for law firms, lawyers, and consultants. The theme has all the tools, features, plugins, and widgets to easily set up a fully functional professional website. Whether you are an independent attorney looking to expand your customer base, a new or established legal firm venturing into the online market, this theme is for you. Lawyer Landing Pro is SEO ready and has been optimized to load quickly. 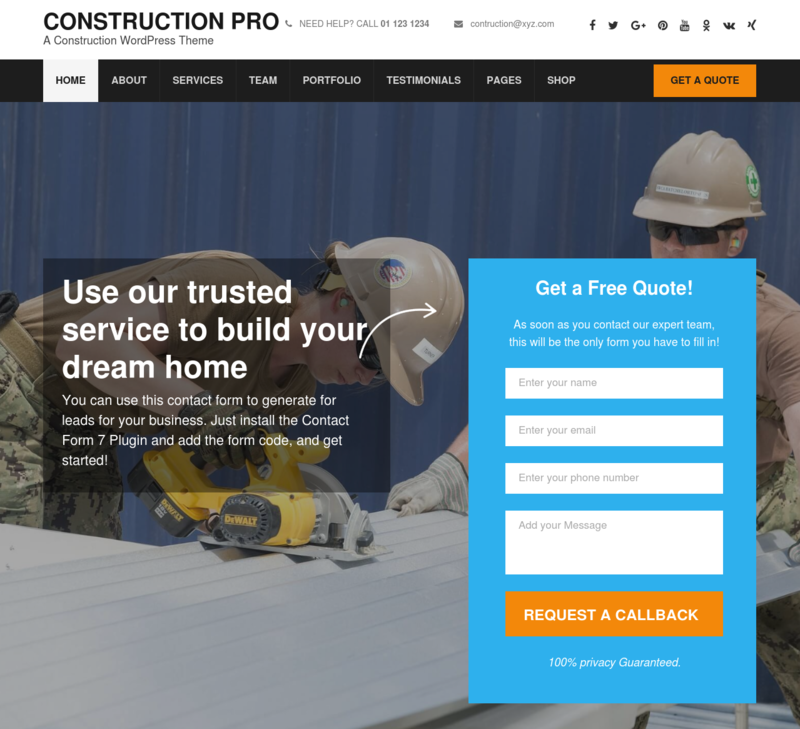 Construction Landing Page Pro is a business WordPress theme designed for construction, landscaping, plumbing, building companies, and those that offer building services. It helps you build a professional website with a built-in portfolio, testimonials, services, team, and other predefined pages to keep your business up-to-date and relevant. It has several thoughtfully placed lead-generating elements to generate leads and increase your company revenue. Spa and Salon Pro is a beautiful, elegant, and responsive WordPress theme suitable for spa, beauty salon, and massage websites. 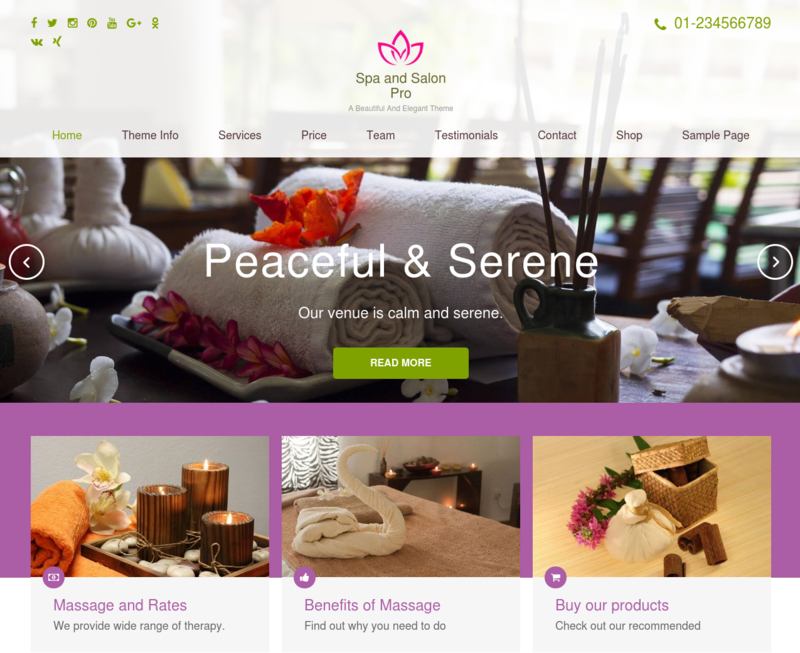 This theme is packed with useful features necessary in crafting an outstanding online presence for your beauty and spa business. The theme comes with a variety of predefined pages and wide customization options that facilitate you to easily personalize your website the way you desire. 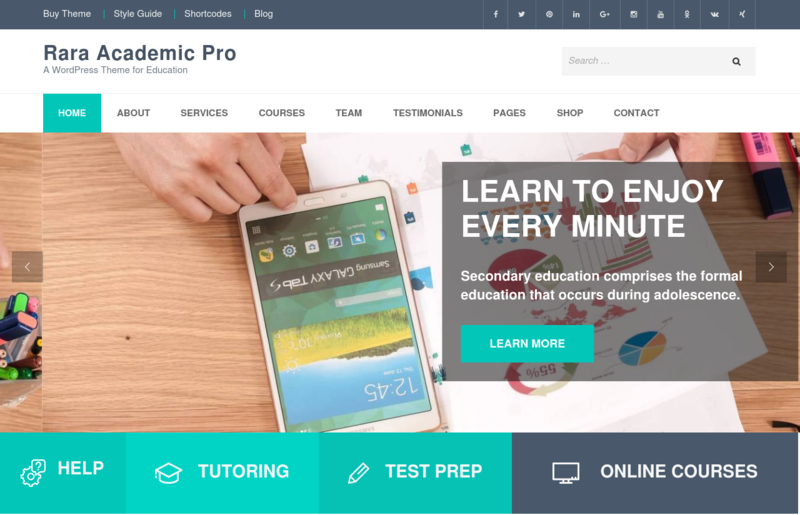 Rara Academic Pro is a beautiful theme designed with a clean and professional look for Educational Portals, Training Centers, Course hubs, Colleges, Academies, Universities, Schools, and Kindergarten. This theme allows you to create unlimited courses, take online classes, and build an open online library for your institution. The theme comes with a variety of predefined header layouts, pages, and customization options which allow you to build a seamlessly professional looking website for your organization or business. 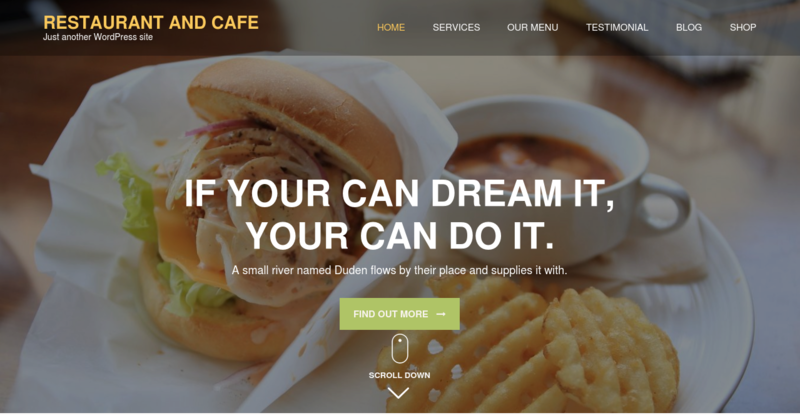 Restaurant and Cafe WordPress theme is a perfect theme tailored for restaurants, cafes, or any food and drink businesses. The theme features plenty of room for showcasing exquisite cuisines, varied menu, services offered, reservation forms, customers’ reviews, and location maps to meet your expectations and give your customer a great experience. Also, it is WooCommerce ready and allows you to sell your cuisines with extensive payment options like credit cards, PayPal, bank transfers, and cash on delivery. 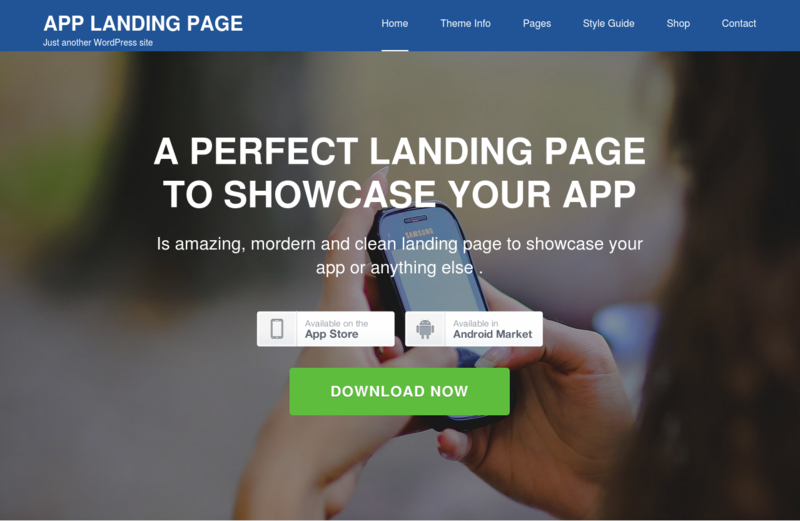 App Landing Page is an amazing and clean theme suitable for creating a perfect landing page to showcase your app. The theme brilliantly shows the advanced features of the app, their uses, user reviews, and updates to constantly increase leads and downloads of the app. 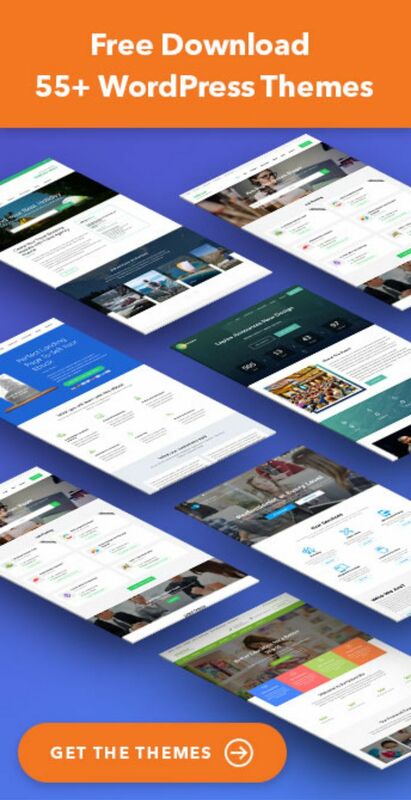 If you want more business themes, here’s our list of 30+ best business themes. The most amazing feature of WordPress theme is that you can customize and set up the website as per your requirements. In this step, I will guide you to perform some basic setup tasks on your website. You can add the site name, tagline, and site logo to set up the identity of your business website. Click on Select logo to browse the desired image and set the site’s Logo. 2. Enter the Page Title for the Page. You do not require to enter anything in the content section for creating a home page. 3. Select the Homepage Template (if any) from the Page Attributes section. Then, go to Default Settings > Static Front Page. You can explore further with images, sliders, videos, and widgets. WordPress provides you a wide range of customization functionalities that allows you to create your own professional business website. Our themes have an extensive documentation that will guide you to modify your website the way you want to. If you have chosen Business One Page theme earlier, you can move ahead with personalizing the website following this Business One Page documentation. 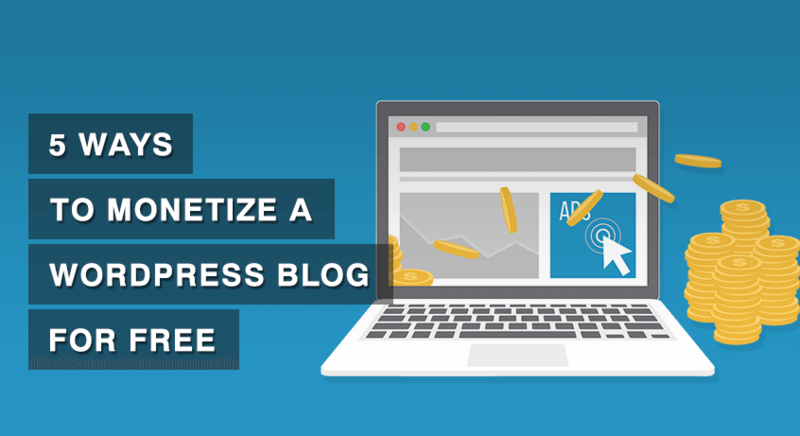 WordPress plugins are bits of software (like apps on your phone) that can be uploaded to extend and expand the functionality of your business WordPress site. There are several business plugins available that will help you create contact or reservation forms, manage SEO, receive payments for your products, and communicate with your customers in real time. After that, on the search bar type the name of the plugin you want to install. I searched for “Yoast SEO”. Then, click on Install Now button to install the plugin. The installation will take few seconds. You will see Installing.. written on the button. Finally, click on the Activate button to activate the plugin on your site. Once the plugin is activated, you will see the list of your plugins. Now, let’s talk about some of the WordPress Plugins that every business website should use. Yoast SEO technically optimizes your website and helps it rank higher in search engines like Google and Bing. It helps you write better content. Yoast SEO forces you to choose a focus keyword when you’re writing your articles and then makes sure you use that focus keyword everywhere. 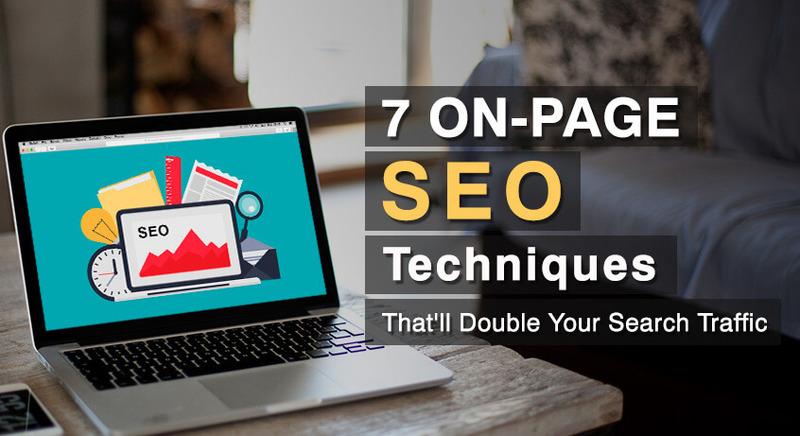 Additionally, it gives you complete control over your site, allowing you to manage page titles and meta-descriptions on a page by page and post by post basis. Wordfence Security is the most used security plugin that performs a whole range of operations to ensure your site is safe, secured, and performs faster. It blocks known attackers, prevents unauthorized logins, regularly scans for vulnerabilities on your website, and provides a whole range of statistics to estimate the threat level to your website. UpdraftPlus is a WordPress backup plugin that allows you to automatically backup and restore your WordPress site. It provides file and database backups of your business website. You can even set up recurring backups and have them stored in different locations, such as Dropbox, Google Drive or FTP. In the premium version, the database backups can be encrypted for additional security. WP Super Cache is the static caching plugin for WordPress. It converts dynamic WordPress website into static HTML files, which are served directly by Apache without processing comparatively heavy PHP scripts. Static HTML files are delivered much faster, significantly increasing the speed of your website. JetPack helps to keep your website secure, increase traffic, and engage your readers with rich, and beautifully presented content. It provides brute-force attack protection, downtime and uptime monitoring, secured logins, and two-factor authentication which keeps your website secure. 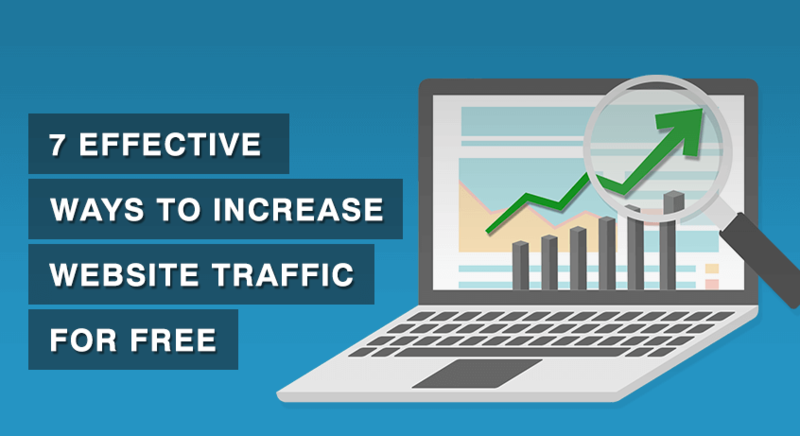 Jetpack also helps you monitor your website traffic by providing site statistics and analytics. It increases user traffic with additional features like email subscription, automatic post sharing, etc. WP Live Chat Support is a fully functional live chat plugin. Business websites can use this plugin to increase sales by communicating directly with potential buyers and responding to their queries. You can customize every feature of your chat experience such as adding your company logo and having full control of all text fields within the plugin. WooCommerce is the best eCommerce plugin for building your online business. It allows you to sell anything, anywhere with extensive payment options like credit cards, PayPal, bank transfers and cash on delivery. With hundreds of free and paid WooCommerce extensions, all your logistic and technical requirements can be easily fulfilled and you will have complete control of your business. Contact Form 7 is a plugin to connect you and your existing or potential customers in order to promote successful marketing. The form supports Ajax-powered submitting, CAPTCHA and Akismet spam filtering. You can easily customize the form and the mail contents flexibly with simple markup and manage multiple contact forms. Now that your website is almost ready, add compelling content on your already beautiful website and grow your business market. You need to consider these two points while writing the content for your business website. Identify and write for your audience – You need to grab your audience’s attention if you want to get your business and product ideas across. Write compelling content so that your audience feels a need to pursue your product/service to fulfill their needs or to solve their problems. The Shorter, the better – Your audience is often browsing or scanning through pages to find the information they need. If they don’t find any helpful information, they will move on. So, try to write the information your audience is seeking as short and concisely as possible. Also, if you want your website to be ranked on search engines, here’s our detail guide on how to OnPage SEO techniques. Here are some of the elements that most of the business websites have in common. You should have them too. Home Page – Provide the basic information about your website here. Add your business name, logo, goal, and about your business on the home page. About Page– Answer the Who, What, Where and Why questions applicable to your business. Services Page – List the services/product your business offers, costs associated and demonstrate how your business is helpful to your audience. Portfolio Page – Showcase the work, experiences, and accomplishments of your business to attract your audience. Team Page – Profile the team members involved in your business and show how they add value to your business. Testimonials Page– Illustrate your clients’ reviews about your business and its services. Contact Page – Add your contact information, location and contact form so that maximum customers can reach you. Well done! If you have followed my guide thoroughly, you have a fully-functional Business Website with all the necessary elements. Wasn’t that as easy as I promised? 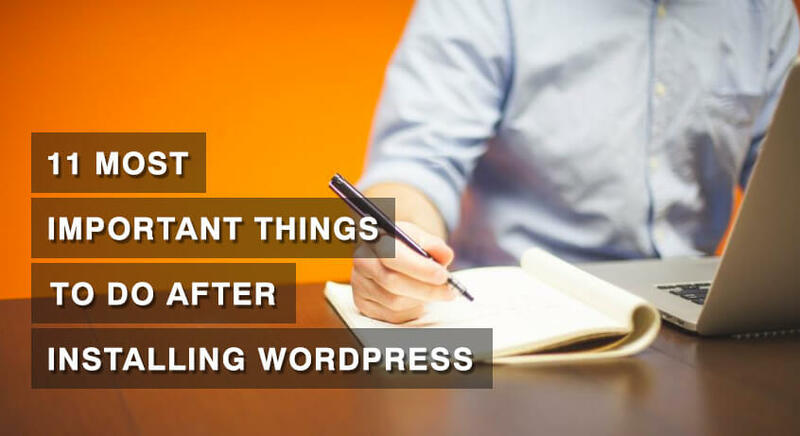 Here are 11 things you should do after installing WordPress for the first time. And, this calls for a Celebration. Go ahead and throw a party. Don’t forget to invite me!